Fit to serve a president, the Amish Jefferson Premier Executive Desk displays a lovely colonial style executive desk that is ready to take on the largest of tasks with style and grace. The fluted columns display the skill of the Amish craftsmen who build solid wood furniture with beauty and function in mind. 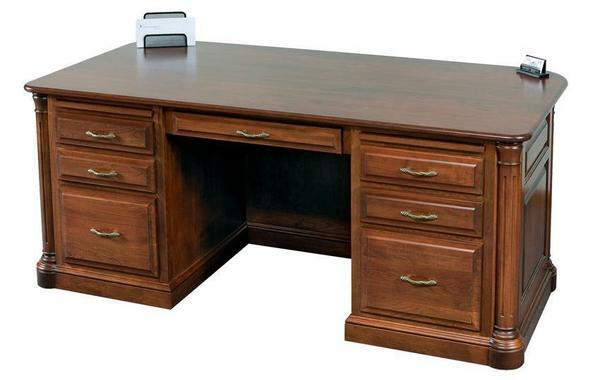 Prepare for a productive workday with a solid wood executive desk to support your activities. Your desk selection is personal as it reflects both your needs and your personal style. Selecting a desk that motivates you throughout the workday is made easy with our wide selection of styles. Review our helpful blog post, "8 Office Desks That'll Get Your Job Done," for a wealth of information on desk styles, options, and functions. Your executive desk helps to define the theme of your home or business office. These grand desks are built to command attention. You'll often find intricate carvings, raised panels and the options for all the extras like leather desktop inlays and soft close drawer slides. Each Amish wood desk that we offer is made in America by skilled Amish craftsmen. Call one of our Amish Furniture Specialists today at 1-866-272-6773 for assistance. We are happy to help you. Overall Depth with Overhang: 36"
Add Light Distressed Finish with Staining, Glazing, Light Distressing, Dry Brushing and Black Speckled Cow Tailing. Call to Receive Sample to Confirm Selection. Note: Because of the nature of Brown Maple expect color variations in the stain. Looking for a stand up desk? Call one of our Furniture Specialist to make this a stand up desk!